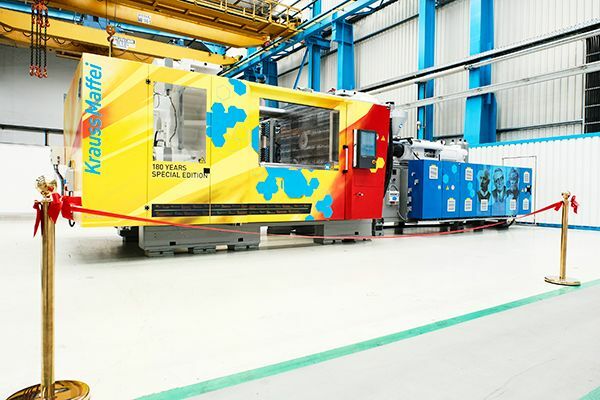 To celebrate 180 years of KraussMaffei and the 180th injection moulding machine for Wirthwein, the two companies took this opportunity to give the anniversary machine a one-of-a-kind look. KraussMaffei delivered its first injection moulding machine to Wirthwein back in 1967. “It was a model from injection moulding machine manufacturer Eckert & Ziegler, which was adopted by KraussMaffei in 1964,” says Udo Wirthwein, current Chairman of the Supervisory Board. Dr. Hans Ulrich Golz, President of the Injection Moulding Machinery segment at the KraussMaffei Group, adds: “This anniversary of the 180th injection moulding machine—180 years after KraussMaffei was founded—is very special for both companies. We are proud of our long, trusting partnership and look forward to many more projects.” The GX 900-4300 is heading to Wirthwein headquarters in Creglingen/Germany, where it will produce high-end window frame covers for the vehicle doors of a South German automaker in the premium segment. KraussMaffei wanted to break new ground in designing the anniversary machine, so it went somewhere completely new and brought in a renowned street artist. For Shamey ABC, designing an injection moulding machine was a new experience and a great personal memory for him. “It was a ton of fun to spray-paint an entire machine with all its three-dimensional surfaces and shapes.” The artwork has a unique, modern style that was received very well by all those involved. “The colourful graffiti is an eye-catcher. We have several young employees who are sure to love it,” says Marcus Wirthwein.